Editor's note: this concert event has passed. Relive the magic of the premiere with the video performance of 'Sing Together' below. Music lives in a part of the brain that's affected last by Alzheimer's disease, research shows. Singing can even help people experiencing memory loss due to Alzheimer's, dementia and other chronic diseases improve their language use and social well-being. Giving Voice Chorus began because its founders had parents with Alzheimer's, knew what music could do and wanted to bring people together. 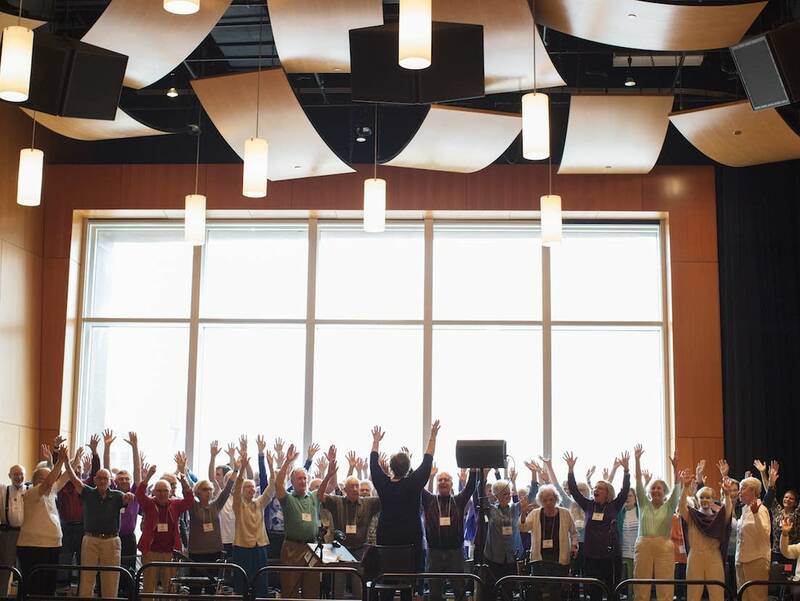 What started in 2014 as a gathering of 30 people with dementia and their care partners is now 160 singers strong across the Twin Cities. 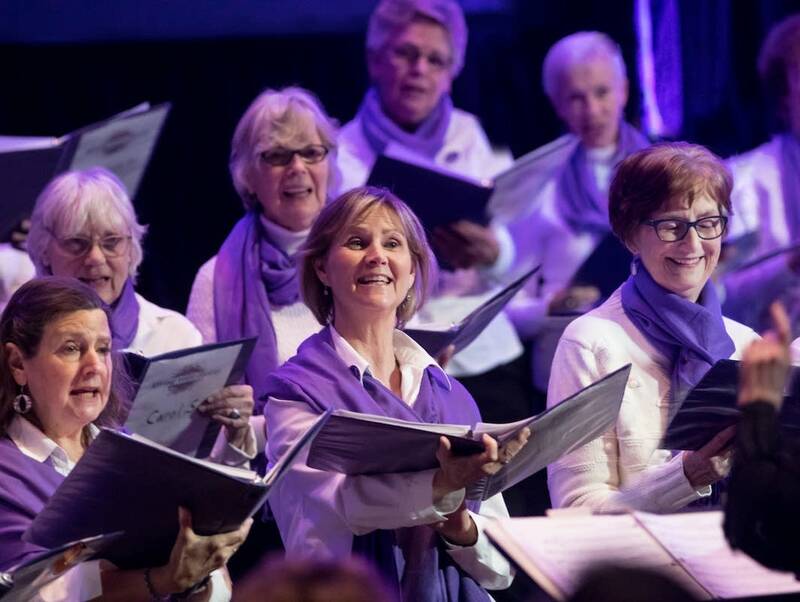 Rehearsing once a week, their musical community is breaking down the isolation that people living with Alzheimer's outside of a care facility face. At Giving Voice rehearsals, no one is the only person with dementia in the room. They're all singers, and when they perform it's impossible to tell who has it and who doesn't. This Saturday, the two Twin Cities choir groups are gathering to premiere Love Never Forgets, a cycle of new songs inspired by the singers themselves. Held at the Ordway Center for the Performing Arts, the concert is a culmination of the American Composers Forum residency program Healing & Hope Through Song in collaboration with Giving Voice and MacPhail Center for Music. When lyricist Louisa Castner and composer Victor Zupanc started the residency a year ago, they were supposed to create 8 minutes of music and had no idea whether they would hit it off creatively. Well, they did. Holding focus groups with the chorus, they discovered the singers were really open to talking about their lives, successes, hopes and dreams. The stories inspired them so much that they could not stop writing. They have finished 13 songs and counting, many of which will debut Saturday. Castner's mother had Alzheimer's and died in 2015. As the resident music director at Children's Theatre Company, Zupanc has done hundreds of shows, but he said this project has hit him harder than others. His father had Alzheimer's and passed away just a few months ago. In those last months, Zupanc would bring Slovenian sheet music and sing with his dad. "He was full of stories and conversations when the majority of the time we spent together there would be no conversation," he said. This and talking with the chorus members has helped him appreciate all they are going through: the good and bad; loss and grief; joy and humor all at once. The Love Never Forgets songbook melds all these emotions, from the empowering first songs "I Am Here" and "I Sing to Speak," to the "Wait All Week Waltz." 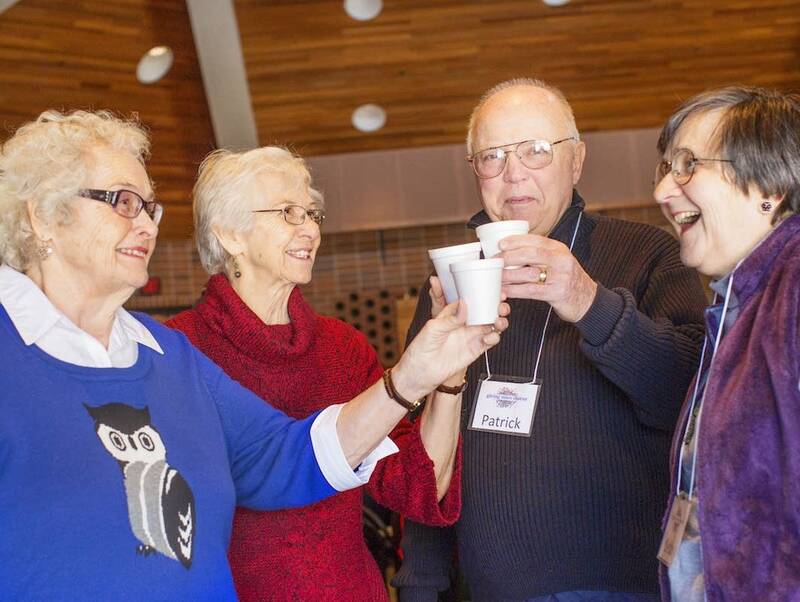 The happy-go-lucky tune shares the singers' love for their rehearsal break full of coffee, cookies and conversation. "Ballad of the Dinghy" speaks to some singers' feelings of isolation, and the relief after floating alone in the storm of having the sun come out and realizing they're in a harbor with other boats braving the same thing. Chorus co-founder and managing director/producer Marge Ostroushko said the sold-out concert will give them more visibility than ever before to show the world the potential of what Giving Voice is doing. The organization's website provides a toolkit geared toward helping others start similar choruses. More than 20 have already sprung up in Minnesota, the United States and abroad. "We want everyone who sings to have the opportunity," Ostroushko said. 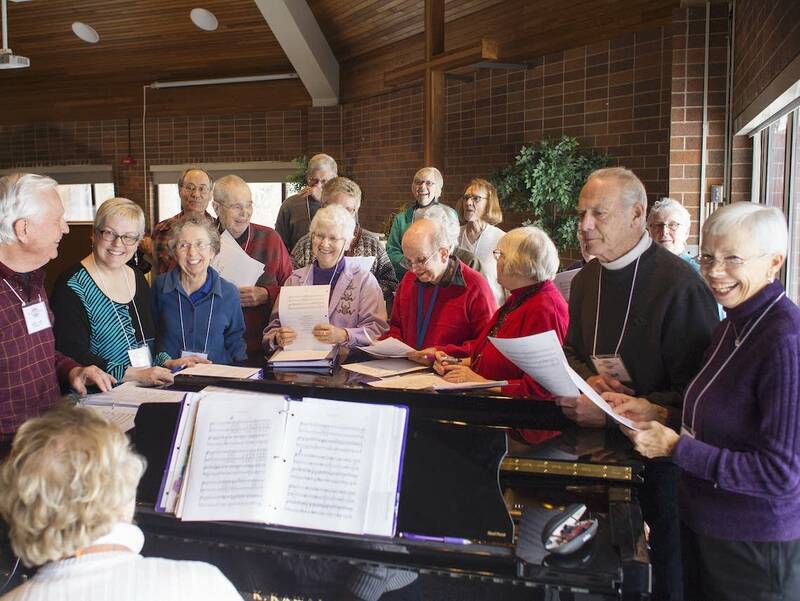 Together with the St. Paul African-American Faith Community ACT on Alzheimer's Team, Giving Voice is launching a chorus for African-Americans with Alzheimer's and their caregivers in St. Paul. 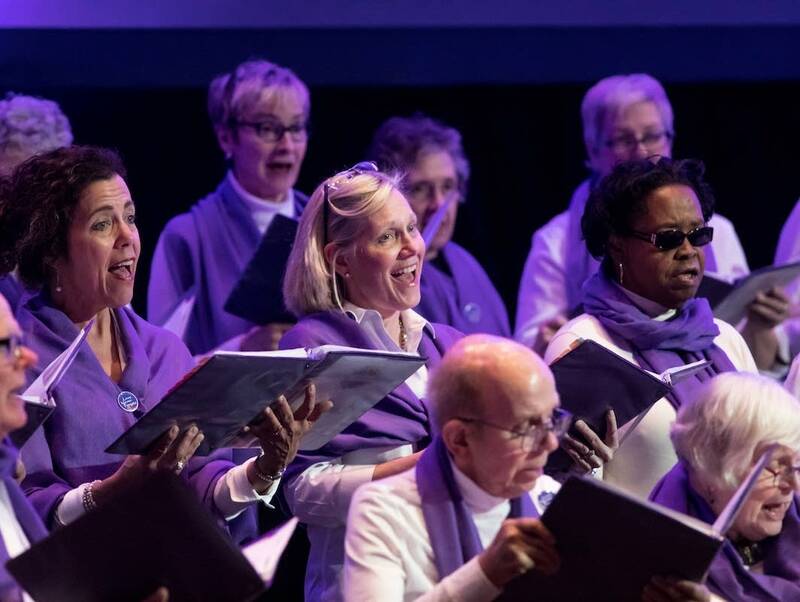 The Amazing Grace Chorus is set to start later this year and raise awareness about the disproportionate number of black Ramsey County residents who are affected by the disease. Kathy Bronner and Mary Henderson of Maplewood started attending the St. Paul Giving Voice Chorus soon after it started, when Henderson heard about it through a care partner support group. Bronner always loved to sing and had been looking for a choir to join, so she said yes. "It's so incredibly beautiful that this is happening so that people are aware that people with Alzheimer's, dementia; MCI can really benefit from this and be involved," Bronner said. Bronner was an academic counselor and retired after 30 years at Apple Valley High School. Henderson is a retired chemical dependency counselor who ran her own business. They have been together for three decades and married three years ago. Bronner experiences mild cognitive impairment, or MCI, which is often a precursor for Alzheimer's or dementia. She is part of the Early-Stage Advisory Group, which helps inform the Alzheimer's Association about how to serve people living with early-stage Alzheimer's. "All of the people here, whether they have MCI or more advanced Alzheimer's and dementia, are people that care for all of us. They like to talk to us, even those people that really struggle to talk to us," Bronner said. And from that talking has come stories that stay with them, Henderson said. "You realize this is a very accomplished group of people," she said. Love Never Forgets premiered June 16 at the Ordway Center. Learn more about the Giving Voice Chorus at the official website.